Palm oil refinery machine is to get rid of the harmful impurities and needless substances in the crude palm oil, aim at improving the oil storage stability, flavor and color. There are five main steps of crude red palm oil refinery machine: degumming, deacidification, decolorization, deodorization and fractionation. 1. Degumming: This is the first step and also the most important section of palm oil refinery machine working process. Add the water (there is a little P-acid in water) to remove the gum. 2. Deacidification: Using alkali like (NaOH) to neutralize FFA in crude red palm oil. During woking process of palm oil refinery machine, soapstock will be produced, then which is separated from the oil. 3. Decolorization: Because there is pigment in crude red palm oil, the oil color is dark. In order to lighten oil color, we need to use the white clay to absorb the pigment away, then using leaf filter to separate the waste clay. If you want to get light color oil, you need to add more white clay. the oil color can be controlled by clay amount. 4. Deodorization: Generally speaking , the crude oil smells not good, which will affect oil storage and price. So we usually use the direct steam to take odors away. At the meanwhile, there is about 0.5% water content in refined oil, because the high temperature in the deodorization pot, dehydration is also finished at the same time. After that, the final oil will be refined once again through safety filter. 5. 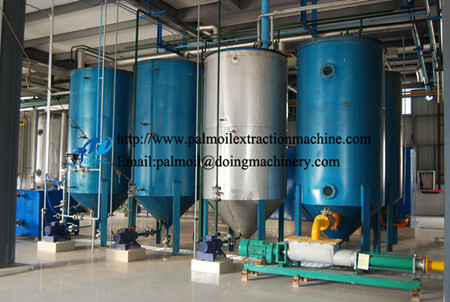 Fractionation: Palm oil is consist of triacylglycerol with different melting point. Under a certain temperature, separate the olein and stearin by their different melting point and melting percentage. This is the final step of palm oil refinery machine working process. 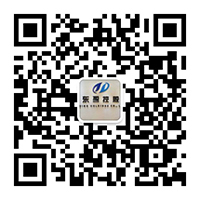 Henan Doing Company has built many palm oil refinery plant project successfully. Recently, 30tpd semi-continuous palm oil refinery machine in Indonesia finished installation. If you are interested in it, you can read the project case. If you wanna to get more details about Crude red palm oil refinery machine you can send E-mail to market@doinggroup.com. You can consult our professional engineer and specialized sales team with leave a message in below form.We will contact with you ASAP.You also can visit our factory in Henan,China.Get Detailed address.